The global goal of the CYBERLEGs Plus Plus project is to validate the technical and economic viability of the powered robotic ortho-prosthesis developed within the framework of the FP7-ICT-CYBERLEGs project as a means to enhance/ restore the mobility of transfemoral amputees and to enable them to perform locomotion tasks such as ground-level walking, walking up and down slopes, climbing/descending stairs, standing up, sitting down and turning in scenarios of real life. Restored mobility will allow amputees to perform physical activity thus counteracting physical decline and improving the overall health status and quality of life. The consortium will pursue the achievement of the global goal by addressing four specific innovation objectives. Further developments of the existing CYBERLEGs hardware modules, namely the 2-degree-of-freedom active transfemoral prosthesis, the active wearable orthotic device, and the wearable sensory apparatus. Further developments of the existing multi-layered CYBERLEGs control system, to enhance its reliable use in real-life scenarios. 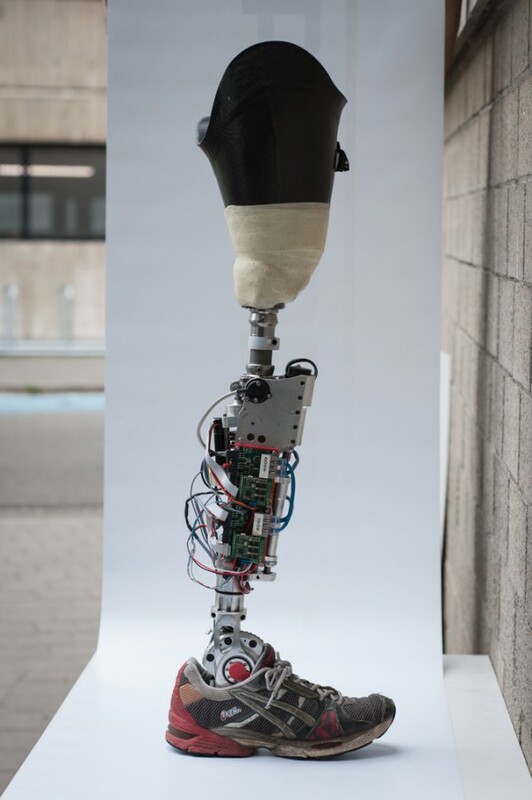 Carrying out two multi-centre clinical studies, that validate the therapeutic potentialities and the economic viability of a robotic ortho-prosthesis which restores the amputees’ locomotion abilities in scenarios of activities of daily living. This proposal focuses on the demonstration in an operational environment (TRL=7) from both the technical and economic viability view point of a modular robotics technology for healthcare, with the ultimate goal of fostering its market exploitation. The proposals involve players from academia, end users, as well as robotics and healthcare industry. For VUB the R&MM research group (Dirk Lefeber & Bram Vanderborght) and MFYS (Romain Meeusen) participate, both groups are member of the BruBotics research center.